Community representatives including Lisa Brown from Forever Manchester (bottom row, far left), Janet Davies from Salford Foundation – Eccles (back row, far left), Dean Lynch from Challenge 4 Change (back row, third from right) and Kelly Willison from Once Upon a Smile (front row, far right) join Pete Styles, director of golf, at Dino Falls and Trafford Golf Centre (front row, centre) for a celebration of Dino Falls first birthday. Volunteers from local community groups and charities including Forever Manchester, Once Upon a Smile, Salford Foundation - Eccles, Children’s Adventure Farm Trust and Challenge 4 Change enjoyed VIP treatment and a fun-packed day of dinosaur action at the Trafford Golf Centre attraction, located in TraffordCity. 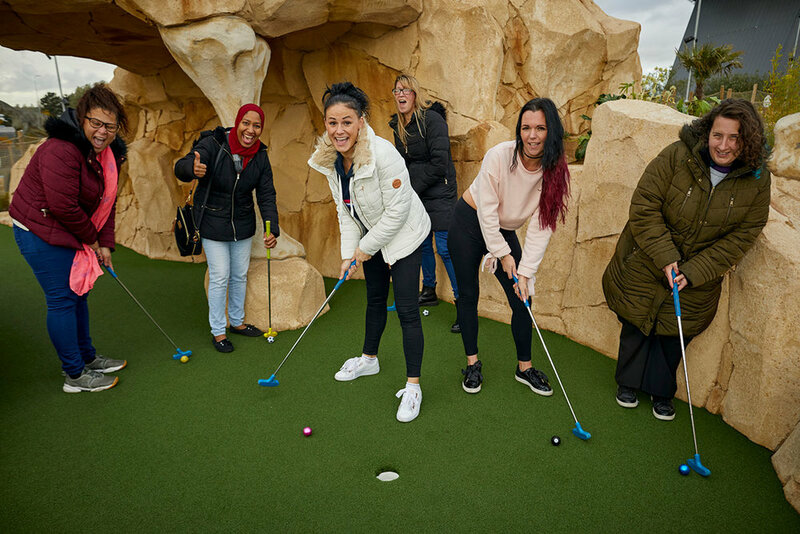 Since its launch in November 2017, Manchester’s Jurassic themed mini golf attraction has seen huge success, and this autumn celebrated the 150,000th round on the 18-hole course, plus a record-breaking day of 1,424 rounds in just one day. Dino Falls Celebrates Record Breaking Summer and 100,000th Round!